The tension concerning the country’s key interest rate hike is expected to peak this week, in the wake of the government‘s latest set of additional measures to curb real estate speculation. While the government seeks to tighten the money market through a possible policy rate hike within the year, the central bank continued to dither over the decision, citing sluggish economic indexes. Further unnerving the hawkish observers here is the largely anticipated rate hike of the US Federal Reserve on Sept. 27 -- right after the imminent Chuseok holiday -- which is to widen the current interest rate gap between Washington and Seoul. Triggering this underlying conflict was Prime Minister Lee Nak-yon, who last week let out the government’s impatience for the long-stalled interest rate. 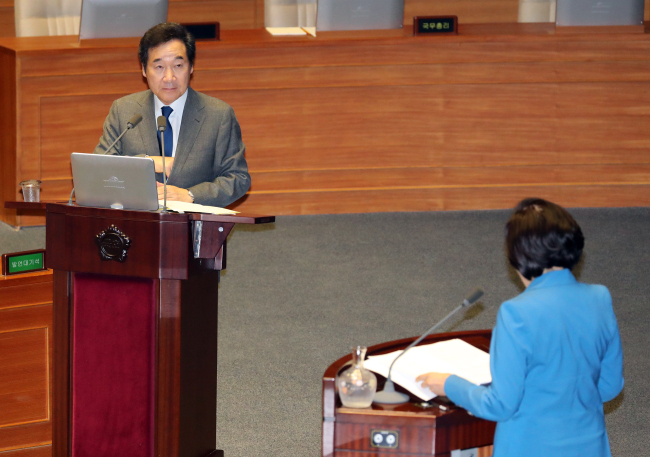 “I agree that it is now high time to seriously consider the rate hike,” Lee said Thursday at a parliamentary interpellation session. The prime minister’s remark was taken as the government‘s clear-cut urge for monetary tightening. “It is not for me to answer as the rate decision is the exclusive right of the central bank,” Cabinet members would customarily say, when asked about the policy rate. The comment also came just ahead of the government’s announcement of additional real estate control measures, which focused on hiking the tax rate and restricting bank loans for owners of expensive properties and of multiple homes. “(The interest cut actions during the past administrations) may have had their reasons but eventually led to an increase of household loans,“ Lee also said, suggesting that the rate hike is necessary to curb the nation‘s record-high household debt. South Korea’s household debt total stood at 1,468 trillion won ($1,311 billion) as of the first quarter this year, up 17 trillion won from the previous quarter, government data showed. Not only Prime Minister Lee, but also the ruling party has incrementally been pushing for a rate hike in the near future. 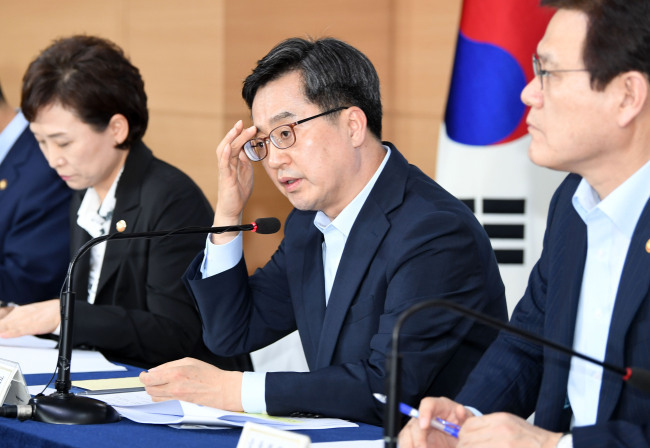 “(The country) is facing pressure for a rate hike, though not immediately,” said Rep. Kim Tae-nyeon, policy chief of the Democratic Party of Korea. Despite the government‘s denial, these series of statements added on to the suspicion that the government was intentionally exerting pressure upon the BOK’s monetary policy decisions. “I believe that the prime minister did not intend to (directly push for a rate hike),” Deputy Prime Minister and Finance Minister Kim Dong-yeon told reporters later in the afternoon, denying the speculations that the administration was intentionally expanding leverage in the monetary decisions. Should the central bank lean toward a rate hike within the year, as suggested by the government, the decision is likely to be made at the next Monetary Policy Board meeting slated for Oct. 18. While this year’s final session is to take place on Nov. 30, Seoul‘s central bank has long been noted for reserving rate-changing decisions in the year-end season. BOK officials, however, expressed uneasiness over what may be seen as the administration’s infringement upon the central bank’s independence. “(The BOK) is making its rate decisions in a neutral stance,” BOK’s Senior Deputy Gov. Yoon Myun-shik told reporters Friday. The deputy chief’s stance came largely in line with Gov. Lee Ju-yeol’s prudent approach toward the rate hike. “The overheating of the real estate market is more attributable to the structural problems (of the economy) than mere economic indices, so may not be solved through monetary policies alone,” Lee had said last month, when the central bank froze the policy rate at 1.25 percent. While taking guard against the increasing rate hike push from the government and the market, however, the BOK also admitted to the possible fallout of an upcoming US rate hike. The US Fed is scheduled to meet on Sept. 27, when it is widely expected to carry out another rate hike, taking its policy rate to 2-2.25 percent. Considering the possibility of a fourth hike in December, the possibility has increased that the interest rate gap between Washington and Seoul may climb up to 1 percentage point by year-end. BOK chief Lee and other senior officials have repeatedly claimed the tightening pace of the US will have limited impact on Seoul’s economy, dismissing the market’s growing anxiety against possible capital outflow.